Meeting the challenge of K3 Option 06 Reshebnik on theoretical mechanics to Taskbook Targ SM 1982. Subject K3 tasks - Study of plane rigid body motion. Flat mechanism consists of rods 1, 2, 3, 4 and slider B or E (Fig KZ.0 -. 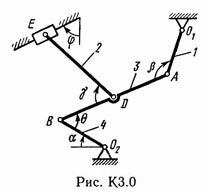 K3.7) or bars 1, 2, 3, and slides in and E (Fig K3.8, K3,.. 9) connected to each other and with fixed bearings O1, O2 hinges; the point D is in the middle of the rod AB. The lengths of the rods are, respectively, l1 = 0,4 m, l2 = 1,2 m, l3 = 1,4 m, l4 = 0,6 m. The position of the mechanism is determined by the angles α, β, γ, φ, θ. 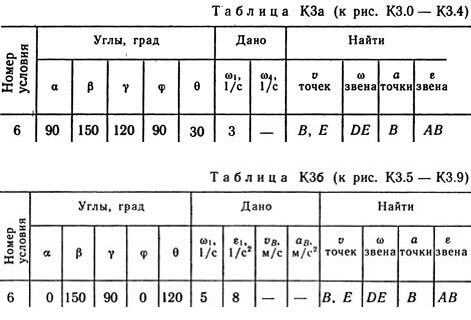 The values ​​of these angles and other predetermined values ​​are listed in Table. ACA (for Figs. 0-4) or in the Table. HSC (for Figure 5-9.) in this Table. ACA ω1 and ω4 - constant. Determine the values ​​shown in the tables in the columns of "Find." After payment you will receive a link to a zip-archive with the decision Kinematics Problem 3 option 00 on the theoretical mechanics of Reshebnik Targ SM 1982 for part-time students. The decision is made by the methodical instructions and control tasks for part-time students of construction, transport, machine-building and instrument-making professions universities. Please leave the decision after receiving a positive response. And you get a voucher with a discount on the next purchase.